This antibody was produced from a aa 113-130 of human ATF3. Synthetic peptide from human ATF3. 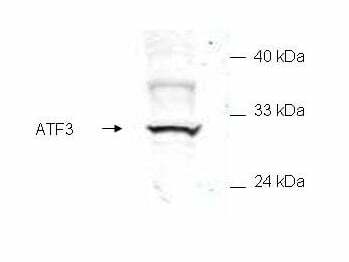 ATF3 antibody was raised against synthetic peptide from human ATF3. Small volumes of anti-ATF3 antibody vial(s) may occasionally become entrapped in the seal of the product vial during shipment and storage. If necessary, briefly centrifuge the vial on a tabletop centrifuge to dislodge any liquid in the container`s cap. Certain products may require to ship with dry ice and additional dry ice fee may apply. Activating transcription factor 3 (ATF3)is a member of the mammalian activation transcription factor/cAMP responsive element-binding (CREB) protein family of transcription factors. It encodes a protein with a calculated molecular mass of 22 kD. ATF3 represses rather than activates transcription from promoters with ATF binding elements. 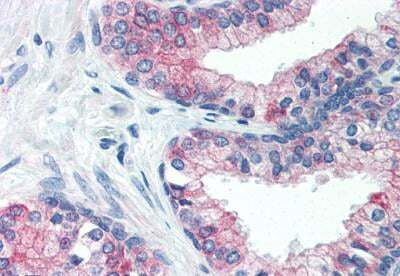 Anti-ATF-3 antibody IHC of human prostate. Immunohistochemistry of formalin-fixed, paraffin-embedded tissue after heat-induced antigen retrieval. Antibody concentration 5 ug/ml. Anti-ATF3 Antibody - Western Blot. Western blot of mammalian whole cell extract transfected with HA epitope tagged human ATF3. Affinity purified anti-ATF3 detects a band ~31 kD corresponding to recombinant human ATF3. Immunostaining using anti-HA epitope tag antibody confirms the composition of the recombinant band (not shown). The protein was transferred to nitrocellulose in 30 minutes using standard methods. After blocking with 5% goat serum and 0.5% non-fat milk in PBS, the membrane was probed with the primary antibody diluted 1:200 in 0.2X blocking buffer in PBS overnight at 4C. Reaction was followed by washes and reaction with a 1:5000 dilution of IRDye800 conjugated Gt-a-Rabbit IgG [H&L] (code for 30 min at room temperature. LICORs Odyssey Infrared Imaging System was used to scan and process the image. Other detection systems will yield similar results. Anti-ATF3 Antibody - Western Blot. Western blot of E Coli whole cell extract transfected with GST epitope tagged human ATF3. Affinity purified anti-ATF3 detects a band ~48 kD corresponding to recombinant human ATF3. Immunostaining using anti-GST epitope tag antibody confirms the composition of the recombinant band (not shown). The protein was transferred to nitrocellulose using standard methods. After blocking with 5% goat serum and 0.5% non fat milk in PBS, the membrane was probed with the primary antibody diluted 1:200 in 0.2X blocking buffer in PBS overnight at 4°C. Reaction was followed by washes and reaction with a 1:5000 dilution of IRDye800 conjugated Gt-a-Rabbit IgG [H&L] (code for 30 min at room temperature. LICORs Odyssey Infrared Imaging System was used to scan and process the image. Other detection systems will yield similar results. 1. Human CHAC1 Protein Degrades Glutathione, and mRNA Induction Is Regulated by the Transcription Factors ATF4 and ATF3 and a Bipartite ATF/CRE Regulatory Element.